It used to require a ticket to ride the Redbird line of subway cars but now you’ll need a set of SCUBA gear to ride these trains. Over 900 New York City subway cars sit on the seafloor, just 16.5 nautical miles (19 mi) from the Delaware shore (Figure 1 – map; See Gallery Above). These subway cars are part of an artificial reef, known as the Redbird reef (after the line of subway car) that have been placed on the seafloor since 2001 (Figure 2). 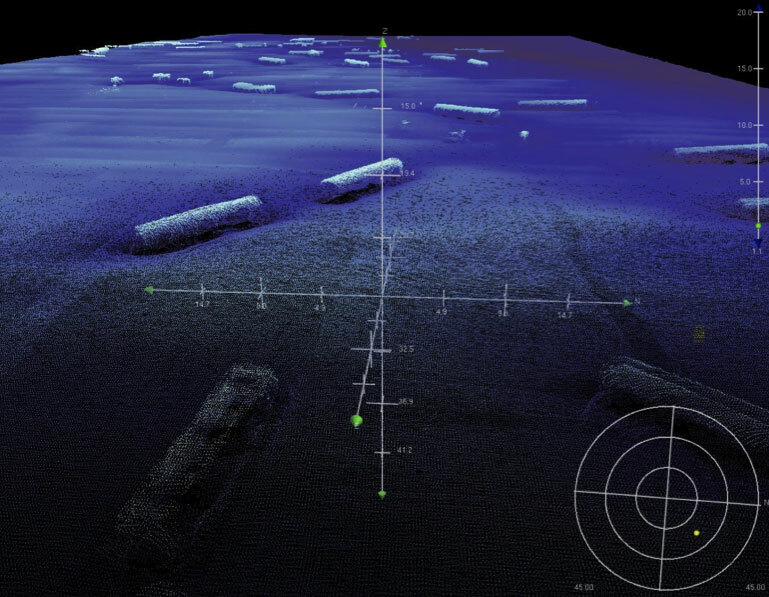 The Redbird artificial reef was established in 1996 when the State of Delaware started putting military track vehicles, ballasted tire units, and retired vessels including tugboats and trawlers in a 1.3 nautical mile area (1100 acres) on Delaware’s continental shelf. The reef, located at 28 m (92 ft) water depth, attracts fish, recreational fishers, and sport divers. The reef objects become completely encrusted in organisms and resembles the vibrantly colored reefs found in tropical climates (Figure 3). This beach of the month is not a beach at all, at least it hasn’t been the beach for several thousand years. Geologists are interested in this artificial reef because of the story it tells about the shifting sand in the area. 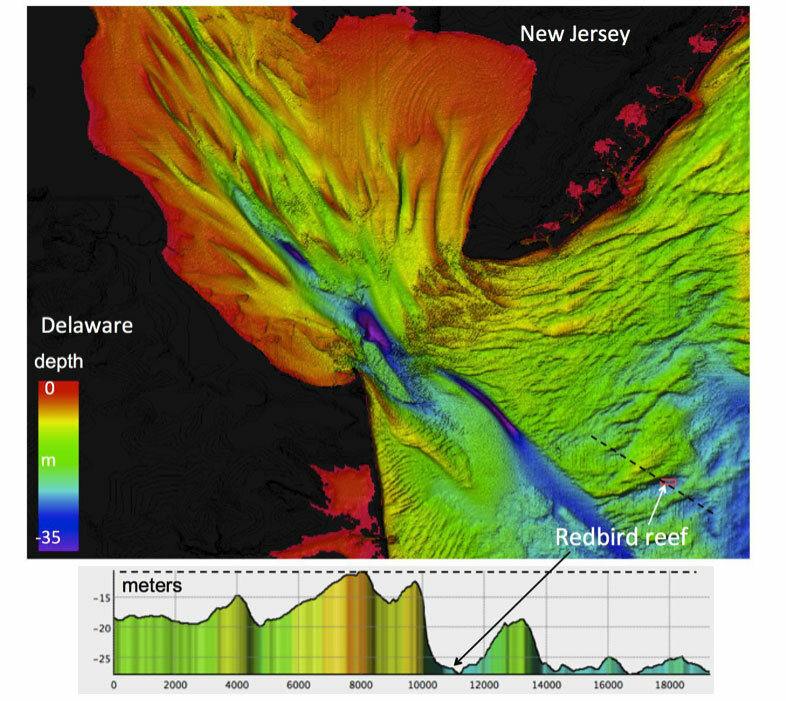 This area is known as the Cape May retreat massif with a series of ridges and swales that mark the location of former offshore features (Figure 1) and was at a time of lower sea level perhaps as recently as 6-7 thousand years ago the location of ancestral Cape May. In fact, sediment samples that we have recovered from the seabed on the top of the ridge exhibit the texture (size) and color of present day beach sands including the tell tale iron oxide staining (rust color) typical of subaerial exposed beach sands (Figure 3 upper left). Meanwhile a sample taken at the base of the swale shows a much different picture and exhibits traits of having come from a less oxygenated environment with darker and coarser sediments consistent with the location of a former tributary of the Delaware River (Figure 3 upper right). Using autonomous underwater robots to take images of the seafloor (Figure 4), scientists can tell that periodic nor’easters that affect the coast from November through March. The storm waves form a coarse gravel, cobble, and pebble moat around subway cars by removing the fine sand and mud near the reef objects. The moat can be several meters (10’s of feet) wide around object, but a shallower comet-shaped halo of gravel and coarse sand can extend ten’s of meters (nearly 100 feet). Not only is sediment moving, but the subway cars are settling deeper into the sea floor over time (Figures 5 and 6). Over 6-7 years cars sunk over 1 m (3 feet). More detailed examination of the reef conditions through time can be found in a recent article by Raineault et al., 2013. The organisms that live on the pebbly and cobbly sea floor in the scour moat are different from the organisms living on the fine sand and mud. We found more sea stars, hermit crab, and clams near the reef objects. The subway cars were entirely encrusted in cold-water coral, anemone, sea stars, and bryozoans. Diver photographs show some large fish swimming through the windows and doors of the subway cars (Figure 3). The ongoing research at the Redbird reef site can help inform decisions about infrastructure construction, including the wind towers currently planned for an area just north of this artificial reef. 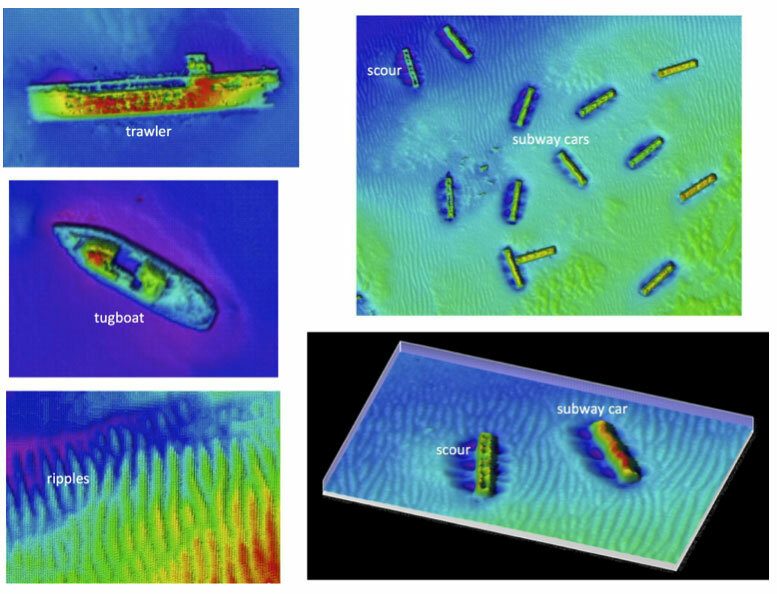 We are now using recently developed computer algorithms (Skarke and Trembanis, 2011) designed to study fingerprints similar to what the FBI uses but instead we are using them to study sand ripples on the seabed. Using the data we collect planners can minimize changes to the sea floor by accounting for the local geology and wave and current conditions when designing wind tower sites. 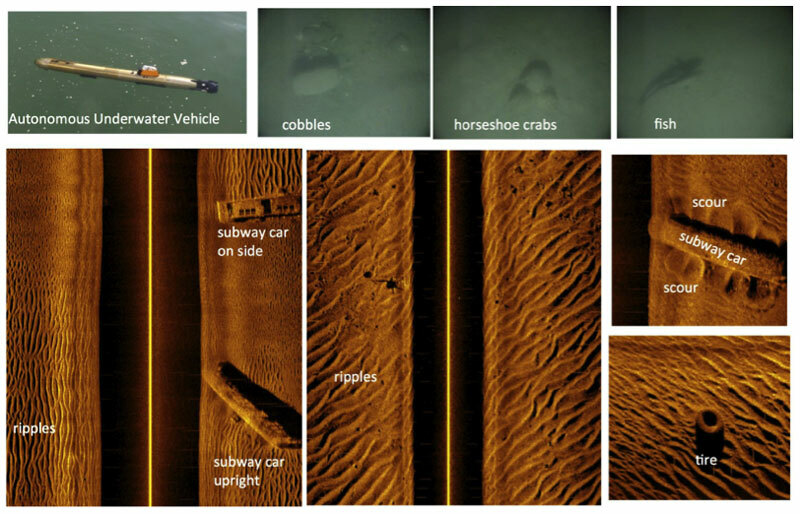 Evidence from the mapping surveys conducted immediately before and after hurricane Sandy indicate significant scour of the seabed in the vicinity of the subway cars and several cars show clear signs of having been moved slightly or destroyed by the storm conditions (Figures 5 and 6). Raineault, N.A., A.C. Trembanis, and D. Miller. 2012. 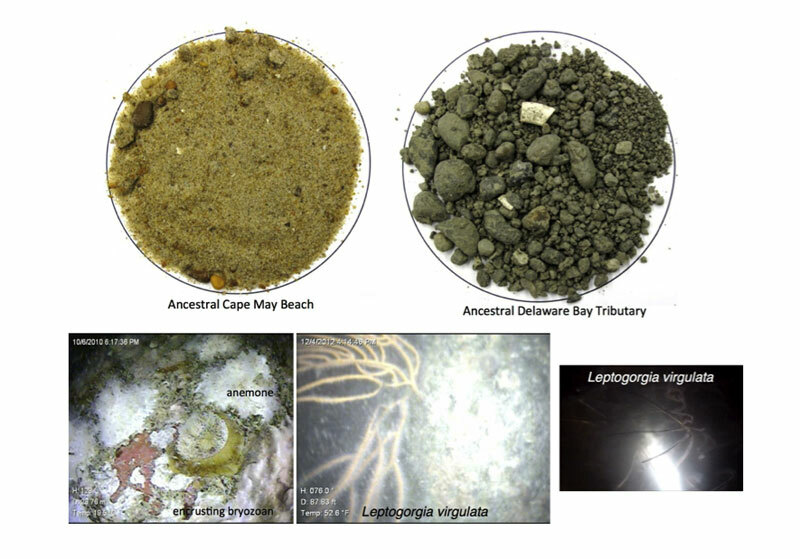 Mapping benthic habitats in Delaware Bay and the coastal Atlantic: acoustic techniques provide greater coverage and high resolution in complex shallow water environments. Estuaries and Coast,. 35: 682-699. DOI 10.1007/s12237-011-9457-8. Raineault, N.A., A.C. Trembanis, D.C. Miller, and V. Capone, 2013. Interannual changes in seafloor surficial geology at an artificial reef site on the inner continental shelf, Continental Shelf Research, 58:67-78. DOI: 10.1016/j.csr.2013.03.008.